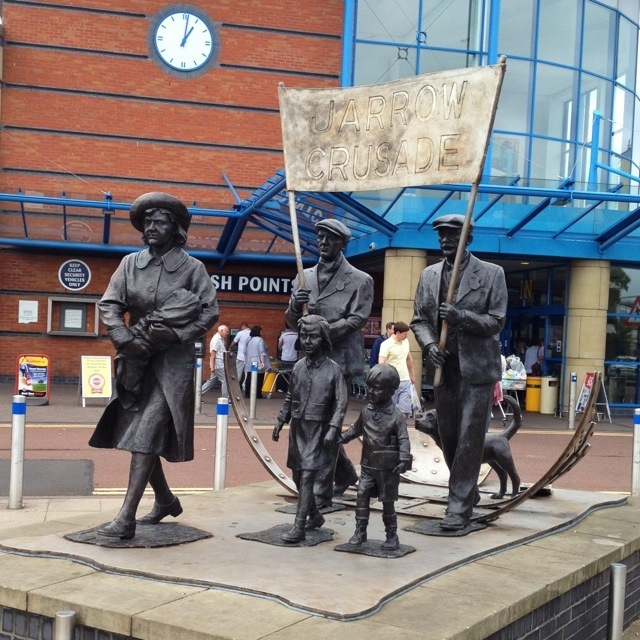 This is Spirit of Jarrow, a Graham Ibbeson statue commemorating the Jarrow Crusade. Surprisingly, it was commissioned by Morrisons, the supermarket chain; less surprisingly, it’s in Jarrow. The Jarrow Crusade was, of course, a 300-mile march of 200 shipyard workers from Jarrow to Parliament in 1936, highlighting the unemployment and poverty of the North East. It certainly didn’t result in a quick win: Stanley Baldwin refused to meet the marchers, and the depression in the North East continued pretty much up until the war. That said, it did highlight the plight of the North East, and generated a lot of popular sympathy. It’s often cited as a milestone in the formation of the modern Labour party: it’s interesting to remember that the formal position of Labour party of the day was opposition, though Labour giant Ellen Wilkinson was its biggest political proponent. It’s perhaps a sad reflection of modern politics that such differences of opinion within a party are rarely tolerated these days. This 1,749th post was filed under: Photo-a-day 2012, Art, Jarrow, Newcastle-upon-Tyne. Comment posted at 16:38 on 2nd August 2012.